A civil war ignited in South Sudan on 15 December 2013. Despite the best efforts of mediators from Ethiopia and Kenya, and pressure from the United States and others, the war has not stopped. The forces of the Government of the Republic of South Sudan (GoRSS) and the Sudan People’s Liberation Army and Movement (SPLA/M) in Opposition are fighting in South Sudan, even while they are talking in Addis Ababa. And even if they reach an agreement, the road to constructing South Sudan as a viable state will be long. While the conflict has been characterized as ethnic, primarily between Dinka and Nuer armed groups, this division masks the more fundamental problem: the dysfunction of South Sudan’s political institutions. South Sudan was deep in crisis from the moment of its independence. 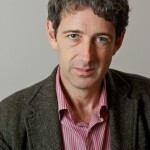 Its problem was not lack of technical capacity, skills or international goodwill, advice and funds. Its problem was a political economy of rent-seeking that has reached an extreme—also known as a kleptocracy. The center of gravity of this problem is the SPLM/A leadership, which failed to regulate, let alone eliminate, massive corruption and ethnic patronage. The best efforts of some South Sudanese public servants, helped by foreign sympathizers, to create functioning institutions have led, at best, to isolated bubbles of integrity in a deeply corrupted system. South Sudan has many capable and committed individuals, but there is almost no space in which they can put their capacities and integrity to use in the national interest. An effective response will require dealing with the incentive structures that cause capable and patriotic individuals to act in a manner that deepens their country’s crisis. In this blog series, I will present the predicament of South Sudan by explaining several key graphics that demonstrate how governance currently functions in South Sudan and why it produces violence with a depressing predictability. This does not include international aid, which is running at about $105/per capita, higher than most other countries in the region, and comparable to Rwanda. As a result, for example, international donors finance 70% of health sector spending. 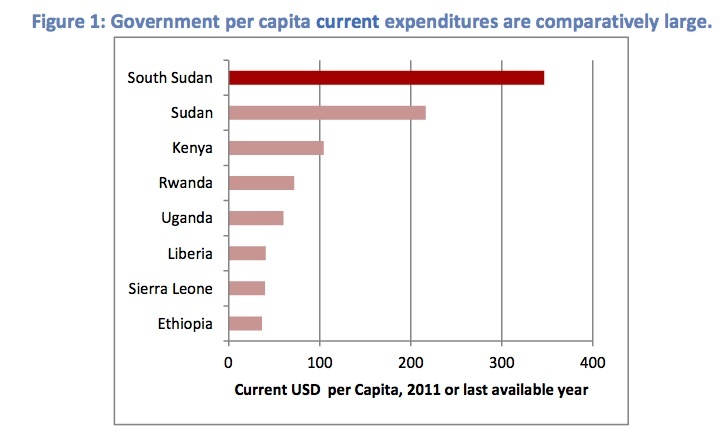 South Sudan started from a lower base than its neighbors, but has had much greater resources. But its spending on services and development is extremely low. 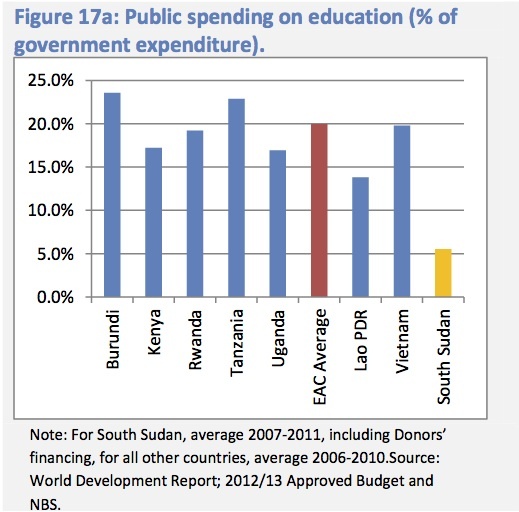 The World Bank’s public expenditure analysis concluded that, “the current pattern of public expenditures, if left unchanged, will not allow meaningful gains in social outcomes in health and education over the foreseeable future.” Even before the recent conflict, it would have taken a generation for South Sudan to achieve the same educational levels as its East African neighbors. Across the board, South Sudan’s human development indicators lag far, far behind. And the Government was making astonishingly little effort to catch up.